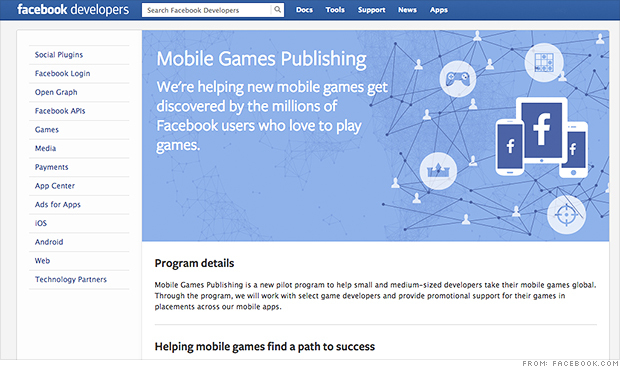 Facebook has launched Mobile Games Publishing. The pilot programme would help small and medium-sized developers extend their mobile games globally. Facebook Mobile Games Publishing is designed to reach people who already play games on Facebook with new games that may interest them, while helping developers who do not have resources for a paid app discovery strategy through Facebook products such as its mobile app install ads. In exchange for a share of revenue with the developers, Facebook will work with selected mobile game developers and provide promotional support for their games in placement across Facebook's mobile apps. The social network will provide its expertise and analytics tools to support the applications at its developer site. The first ten developers taking part in the programme are based in countries around the world. They include 5th Planet's "Dawn of the Dragons" RPG card battle game, Brainbow's "Dr Newton: The Great Brain Adventure" puzzle-packed adventure game, Certain Affinity's "Age of Booty: Tactics" pirate-themed strategy game, and Gamevil's "Train City" city building simulation game.